These two players made me listen again to this cello music for exactly the same reason that Ronald Brautigam made me listen again to the Piano Sonatas, namely the use of a period keyboard. Christopher O'Riley uses a Broadwood fortepiano from 1823. Just six years earlier in 1817 Thomas Broadwood had given an almost identical model to Beethoven himself. So what we have here is as close as it can be to the keyboard Beethoven knew and indeed expected in the Op.102 works. This is no minor matter, for this fortepiano can make sounds impossible to emulate on a standard modern grand. The balance between cello, here a gut-stringed Goffriller of 1710, and fortepiano is significantly changed. As the notes say 'the cello can easily overpower its partner', so adjustments have to be made to allow the nuances of the fortepiano through. The Broadwood has the ability to damp either the top or the bottom of the keyboard, or both, and to shift the keyboard sideways to produce 'una corda' effects where the hammer strikes just one string. This last is used frequently to quite magical effect. Beethoven wrote sonatas for this instrumental combination in his early, middle and late periods. The Op.5 pair from 1796 were a strikingly new use of what had, until then, been mainly a continuo pairing. Even Haydn's many Trios for violin, cello and keyboard did not give the lowest instrument such solo status. It is a strange combination because the keyboard, regardless of type, has a wide range of pitches with considerable strength in the upper registers. The cello by contrast is essentially a low instrument. Listening to these sonatas requires a curious division of attention to both high and low registers. Beethoven constantly challenges his players and his listeners to focus in a way not demanded by, for example, the standard violin and keyboard combination which occupy similar registers. It is not only the sound, but the quality and originality of invention that strikes the listener. 1796 was just five years after Mozart died and Haydn was still busy writing symphonies for London. In Berlin the young Beethoven, yet to write a string quartet or a symphony, was producing a startlingly new sort of music. The Sonata Op.69 in A major is much the most frequently played today and is fully the equal in invention of the Pastoral Symphony and the Ghost Trio which preceded and followed it. The two late sonatas are in the period of the last piano sonatas and are just as unexpected in invention and as deeply felt. Matt Haimovitz and Chris O'Riley are well established and stand comparison with any similar duo. They have the technical skill and musicianship to extract all the subtlety and power from the five sonatas as well as the three sets of variations. Pentatone have launched a new series co-produced with US-based Oxingale Records, and this is the first fruit. The notes are a nice blend of personal reflection and academic insight. 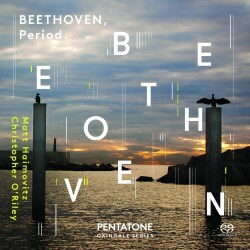 The recording is everything one expects from Pentatone in terms of clarity and spaciousness. A joyful and often moving experience that quite changed my view of these works. First class.